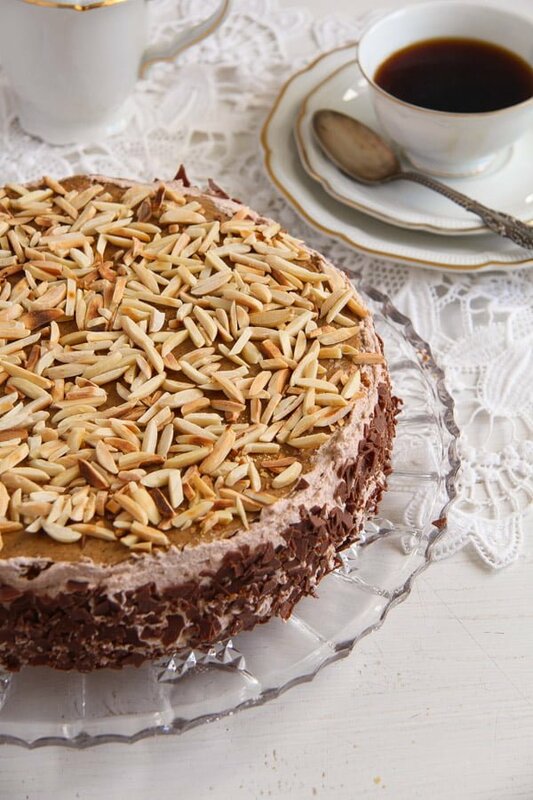 A decadent Polish cake recipe, with lots of almonds and a sweet and luscious coffee caramel buttercream filling. If there is one sure way to make Dieter happy is to bake him a cake. The sweeter, the better. Preferably with lots of whipped cream and fruit, but buttercream is always great too. 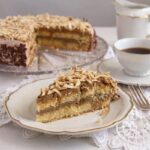 Some of his other favorites are the Moist Chocolate Gateau or Cake with Chocolate Cream Filling , the Strawberry Cheesecake or the German Apple Almond Cake with Meringue and Cream . 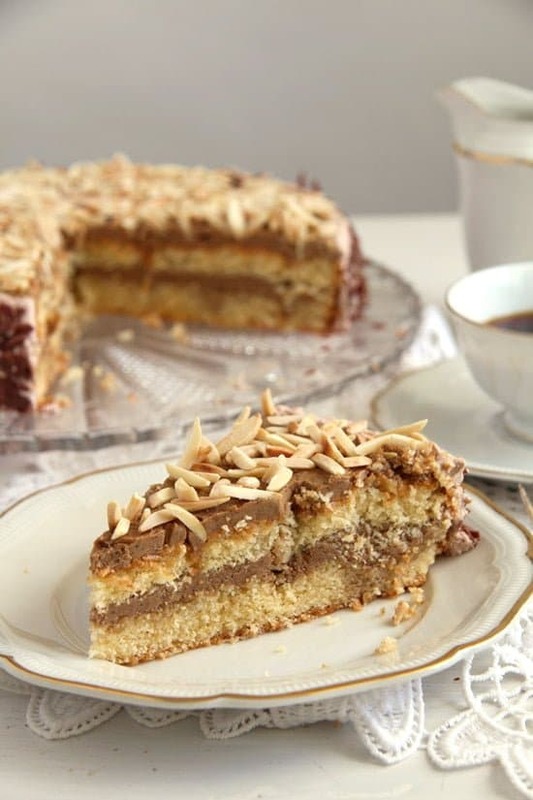 This cake is not particularly difficult to make, but it is also not necessarily for beginners in baking. The original recipe was quite inconvenient, requesting for 3 cake pans (who has 3 cake pans of the same size in the kitchen???? ), lots of almond blanching, roasting, grounding and chopping and a few ingredients in small quantities, which I did not want to buy. Things like instant coffee, I buy a jar for a recipe and end up throwing away the rest, months later, because I really don’t enjoy drinking instant coffee and even if I manage to bake some more coffee cakes in between, there is still so much coffee leftover. So, instead of three small cake bases, I only baked a larger one, used already blanched, chopped/ ground almonds, which only needed some short roasting time in a pan, replaced the coffee sort, simplified the method of making the coffee caramel buttercream and soaked the rather dry base with some more coffee. 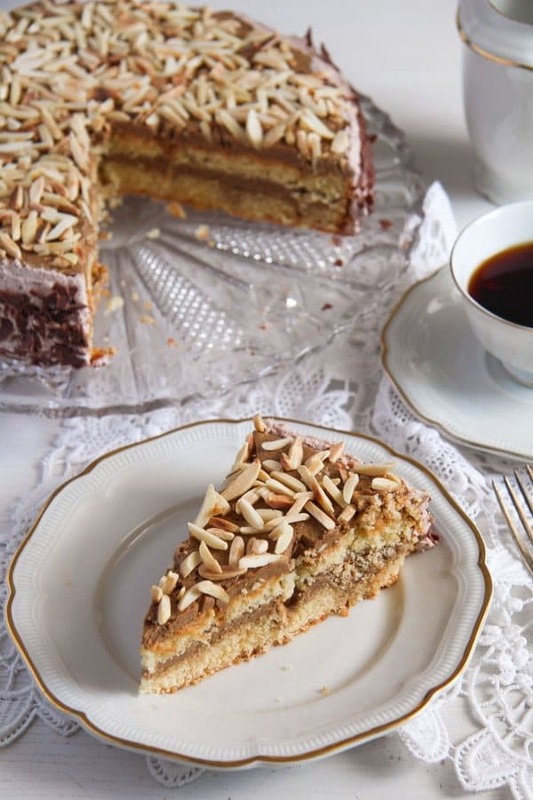 The resulting Almond Cake with Coffee Caramel Buttercream – Polish Tort Migdalowy was delicious, I cannot imagine it being any better, actually. Preheat the oven to 175 degrees Celsius/ 350 degrees Fahrenheit. Grease a springform 26 cm/ 10.2 inches and sprinkle it with some flour. Shake to spread the flour all over the form and pat the form on the bottom to remove the excess flour. Give the ground almonds to a pan and roast them, without adding any fat, for a couple of minutes. Keep an eye on the pan and stir often, the almonds will burn easily if unattended. Transfer immediately to a plate and let cool while you mix the batter. Give the butter and the sugar to a mixing bowl and mix well until light and creamy. Add the eggs, one at a time, mixing well in between. Mix the flour and the baking powder together and sieve them over the egg mixture. Give the roasted almonds to the mixture and incorporate. Pour the batter into the prepared springform and bake in the preheated oven for about 40 minutes or until a toothpick inserted in the middle comes out clean. Leave the cake in the pan for about 5-10 minutes, then transfer it to a wire rack and let it cool completely. You can bake the cake one day in advance, let it cool, wrap in cling film and fill it the next day. In the meantime give the slivered almonds to the pan you used before and roast them as well, stirring often and keeping an eye on them. They should be golden brown. Immediately transfer to a plate and let cool. To make the buttercream start by brewing the coffee. Give the ground coffee to a cup and pour the boiling water over it. Allow to infuse while you prepare the rest. 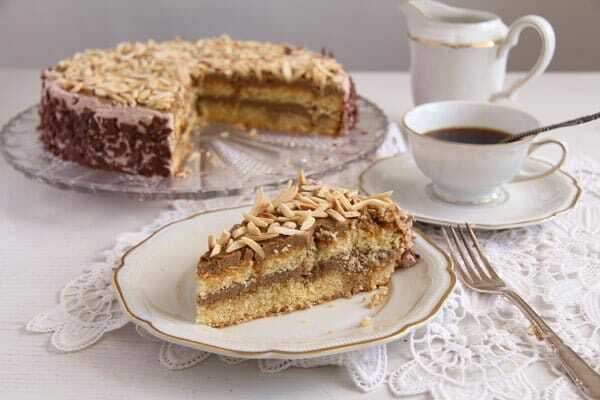 Make another small cup of regular coffee, you will need a few tablespoons for soaking the cake base. Drink the rest. Give the sugar and the water to a small heavy bottom saucepan. Heat until the sugar dissolves and the mixture starts to simmer and then let simmer for 3 minutes. Careful not to burn yourself with the sugar. Give the egg yolks to a mixing bowl. Slowly pour the sugar syrup into the mixture while mixing all the time until the mixture thickens. Cream the butter until light and fluffy. Slowly add the sugar-egg mixture while mixing all the time. Sieve the thick coffee over the bowl. Discard the coffee rests. Mix well. Slice the cake once. Place one slice on a serving platter. Soak it with 3 or 4 tablespoons of the regular coffee. 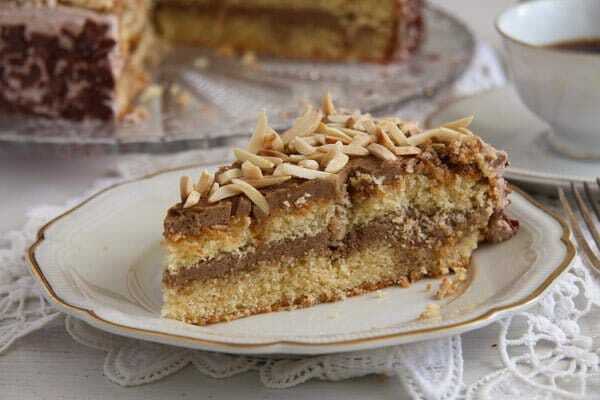 Give half of the caramel buttercream on the first slice and top with the second slice. 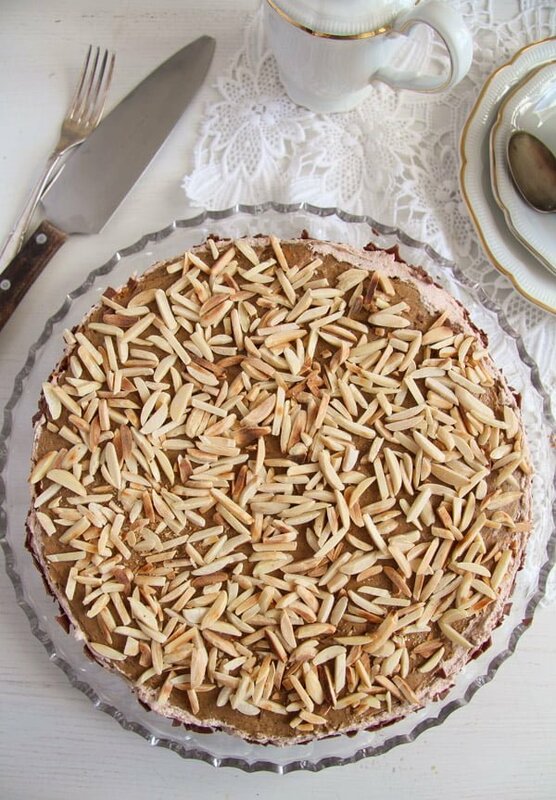 Give the rest of the buttercream on top and sprinkle the roasted slivered almonds all over the top of the cake. Optional: beat the whipped cream with the unsweetened cocoa powder and the cream stabilizer until stiff. Spread the whipped cream on the sides of the cake and sprinkle with chocolate sprinkles. This cake looks so good! I love the flavors combination! The cake looks lovely. I’m sure I would like it. Gorgeous cakes. I love all almond bakes. And may your step father in law continue to enjoy all the sweets! Sounds wonderful. Adina, I have been reading your blog for about a year now, and I find it such a welcoming place to be. Your cakes are so beautiful! This one really caught my eye as I think my husband would love it! A couple of questions, if you’d be so kind to help – Is ground almonds the same as almond flour? And in the optional ingredients/topping (I think) it calls for 100 ml or scant 1/2 cup – I’m assuming it’s cream, but it doesn’t say. Thank you for sharing such a wonderful variety of recipes! So nice to read your comment. Thank you. ☺ Yes, cream for the topping. Sorry about that, I feel that I read a recipe 20 times before posting it, but still I miss something sometimes. We only have the term ground almonds in Germany, but I did a bit of search online and almond flour seems to be pretty much the same thing only made of blanched almonds which do not have their brown skin anymore . You can use that or ground your own almonds in the food processor. Not too long though or they will turn into almond butter. I hope you will like the cake!